Croatian Web Hosting Review 2019: Is Croatian Web Hosting a Good Hosting? Zagreb-based Croatian Web Hosting sells a really comprehensive selection of hosting plans from a nicely laid out website. Croatian Web Hosting is located in Zagreb. They own their own data center, and they provide a really comprehensive selection of hosting plans from their nicely laid out English-language website. 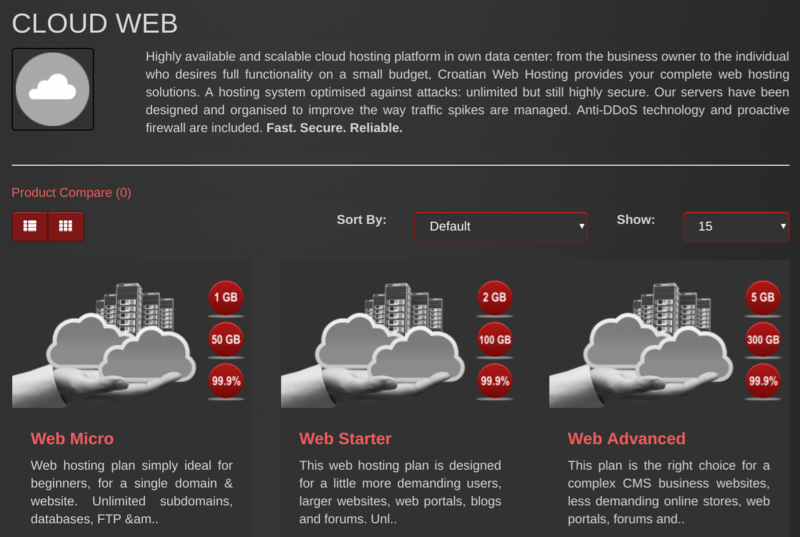 Croatian Web Hosting owns and operates it’s own data center in Zagreb. It’s great (and quite rare) to find a company that owns its own center, which should ensure rapid resolution of issues and no overselling of resources. It’s even better to know that the center is Tier III with 99.982% availability and N+1 redundancy. In layman’s terms, a Tier III data center means you should expect less than 1.6 hours of downtime per year. This provider sells five shared hosting packages – Micro, Starter, Advanced, Ultimate, and Corporate – with 1GB to 50GB disk space, 50GB to 1TB monthly bandwidth, and up to 20 domains. As well as pretty hefty inclusions, all plans come with unlimited subdomains, email accounts, and databases. You also get FTP access and a one-click installer for 100 programs. All plans include daily, weekly, and monthly backups plus DDoS protection technology and firewall. Although Croatian Web Hosting is not the cheapest hosting provider, the prices are very good value for money considering the substantial resource quotas for all of their plans. And, unlike lots of companies, they don’t “nickel and dime” you. They throw in a free SSL certificate and domain registration with all hosting plans. You can purchase this provider’s plans on one, three, six and twelve-month terms, and get a deep discount for purchasing a longer plan. They also offer a 14-day money-back guarantee that should make you feel better about making the commitment. 24/7 support can be accessed by email, live chat, telephone, and ticket. I’ve chatted with them several times on live chat, and the operator has always picked up straight away. They were not only polite but also very knowledgeable and happy to help. The excellent customer service could only be improved by the addition of a knowledge base on their website. Croatian Web Hosting is a very professional company. They own their own Tier III data center and they offer an excellent uptime guarantee. Great customer service and comprehensive plans make this a great company to choose. Wondering how Croatian Web Hosting stacks up against other Web Hosting companies? Enter any other Web Hosting company and we will give you a side-by-side comparison.